In the Next Financial Panic They might Close Stock Markets, Banks, Funds etc. 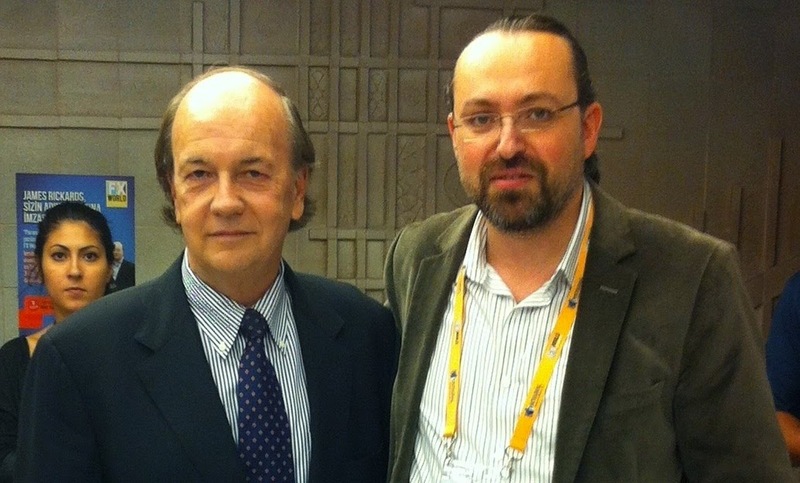 James G. Rickards is an American lawyer, economist, and investment banker. He is a regular commentator on finance, and is the author of The New York Times bestsellers Currency Wars (2011) and The Death of Money (2014). Rickards worked on Wall Street for 35 years. As general counsel for the hedge fund Long-Term Capital Management (LTCM), he was the principal negotiator in the 1998 bailout of LTCM by the Federal Reserve Bank of New York. In 2001, Rickards began using his financial expertise to aid the US national security community and the US Department of Defense. He served as facilitator of the first ever financial war games conducted by the Pentagon. Currently, James Rickards is a portfolio manager at West Shore Group and he lives in Connecticut. Rickards attended Forex World Istanbul and delivered a presentation on currency wars at the event on Friday. I found the opportunity to ask a couple of questions to Jim following his book signing event. I am sharing this short interview and Rickards’ exclusive comments here. -My first question is, what do you think about ‘Abenomics’ this historical money printing experiment taking place in Japan? -Japan has been in depression since 1990 so it is a 25 years depression. Depressions cannot be solved with liquidity or monetary solutions. Depressions can be solved with structural solutions. You have structural problems so you need structural solutions. Through all this time Japan tried monetary solutions. They tried money printing, they tried lower interest rates, they tried stimulus but they could not make fundamental structural reforms for their economy. So that’s why they were not able to get out of the depression. Abenomics will fail. It is failing unless they make structural solutions. But since they have not I expect their depression to continue and spread throughout the world. -Why they cannot make these structural changes? -It is mostly cultural because structural means you have to allow banks to fail you have to allow businesses to fail you have to allow competition you need a greater role for women you have to lower taxes these are structural things they have nothing to do with liquidity or monetary policy. The problem is about how the diet (Japanese parliament), the prime minister’s office and finance minister’s office will organize the economy. I recently met with Eisuke Sakakibara in Korea. He is called ‘Mr. Yen’. He is former deputy finance minister. He said one of the things you have to understand about Japan is that the population is actually declining so even if you have zero GDP growth the per capita GDP would increase… Japan is not a poor country it is a very rich country. The stores are up the restaurants are up on sale. They don’t feel the press but actually they do not have growth and I expect this to continue. -You said (in your earlier speech) that you don’t expect a rate hike in the US in 2015. -What do you expect for Japanese guys for 2015? Will they continue stimulus? -Yes. They are trying to solve a structural problem with a liquidity solution. It won’t work but they think it will work. My opinion does not matter. What matters is what’s Janet Yellen’s opinion, Kuroda’s opinion and Abe’s opinion. They think this will work and so they gonna keep trying. It wont work and they wont be able to raise rates. Because they won’t gonna normalize rates in a world where growth is not going back to trend. -What about the role of BIS, in today’s picture and can it have a future role like you described for the IMF? -I think in terms of a central bank of the world that is really the IMF. The BIS is very important for two reasons. Number one: They are the primary intermedia for manipulating the gold market. That is not a mystery… BIS is manipulating the gold market. They are the intermedia between the central banks and commercial banks and other central banks (of the world). They have been doing that… That’s why they were created in 1930s and they have been doing it ever since. (Number two): … It is also a very important meeting place for the central bankers. One of my partners was David Mullins Jr. He was the vice chairmen of the Federal Reserve in early 90s under Alan Greenspan. He said that Greenspan did not like the (program) and stood off and David would go to the BIS place. You know it is a clubhouse. Only central bankers are allowed ... So it is a great place to change information. I think the BIS is very important but I don’t see it is the world’s central bank I really think that role has been left to the IMF. -Last question Jim, you are telling us in your books that there would be a financial panic... Can you describe us what kind of events could happen during this financial panic? What are your expectations? -Thank you very much Jim. -Thank you, it was nice talking to you.